This article describes the work carried out by Simon Dillon during expeditions in Alaska and Western Canada in 1997 and 1998. Simon continues to visit the area annually (wife permitting) and the article will be updated after this year?s expedition. The text is extracted from two reports produced by Simon. The expeditions were joined by club members Simon Dillon in 1997 and 1998 and by Simon, Nick Smith and Dave Kenyon in 1998. Since 1988 the Glacier Grotto had been working with the United States Forest Service in one way or another, however, the Tongass Cave Project (TCP) Came to life in 1991, and was formed by, Kevin Alired, Pete Smith, and Steve Lewis. The Cavers have since donated over 40,000 man hours to the forest service and have contributed around $750,000 to cave conservation, this includes cost of travel to Prince of Wales Island, equipment, and free time to organise the expeditions. Whilst the forest service have donated around $2-300,000. The USFS contributed $17,000 towards the 1997 project. The TCP has discovered nearly 500 caves and mapped 300 throughout the Tongass, and in 1988 El Cap Pit was explored and surveyed, the deepest single drop pit in the USA at 598 feet. Karst is now a common word in the planning of the Tongass National Forest. Kevin and Carlene Allred were the first cavers to do much real work in the Tongass (see February 1995 and April 1993 NSS News for more history). The TCP has had expeditions on Prince of Wales Island, Dall Island, Etolin Island, Heceta Island and on Chichagof all of which are in South East Maska. The 1997 project was carried out on Heceta; a total of 50 caves were found, and 1888 meters was surveyed. The main objective of the TCP is to protect the Karst regions of the Tongass National Forest, the largest temperate rain forest in the USA. The Forest Service are obliged by the 'Cave Resources Management and Protection Act 1988' to protect the caves and the Karst areas. Also the Forest service as of 1997 now has its own guidelines, the 'Tongass Land Management Plan' (TLMP), this is also meant to mirror the Cave Protection Act. When we find and map a cave the forest service place a 100 foot buffer zone around the entrance of the cave and they cannot cut any trees within the buffer zone. However, when they have cut to the buffer you get what is called wind blown, and the buffer zone usually gets blown down and lands in the cave entrance anyway. We are trying therefore to get what is known as a wind firm buffer. This is two full tree lengths, and when you see the height of the trees that is a large area, which would have the dual effect that the more caves we find close together the greater the area we would be able to protect. In the TLMP the karst is divided into three categories, Low, Medium and High Vulnerability, the latter receiving greater protection. The TCP are trying to make the Forest Service understand that just because there are no visible karst features on the Low vulnerability areas, it does not mean that when the trees are cut that this will have no effect on the high vulnerability areas. Over the years we have collated much evidence to prove that when they log on LV karst the soil wash off will effect the cave environment in HV karst areas. Also, with the trees gone, there is nothing to take up the rain fall ? the Tongass gets between 150 and 200 inches rain fall a year. In 1996 the Forest Service told us they were going to log only some small units. When we arrived in 1997 we found that they were logging 21 large units, and a large part was on HV Karst, so our main effort in 1997 was spent walking the units looking for new caves and locating any significant karst feature that fell within the TLMP. Many features were found in around 60% of the units, and the Forest Service were in clear violation of their own guidelines. It was time to force our evidence down the big tree eating monster and try to choke it, however we knew that this would not be easy. Five days alter the expedition was over, Steve Lewis and Simon returned to Heceta Island with five of the top people from the Thorne Bay Forest Service and showed them clear violations they were making, but, for want of a better expression, we might as well have pissed into the wind, for what use it was having. They could only see as far as the next tree that they wanted to cut down. We left the Island dejected but with still enough ammunition to fight. Stage 2 would come into effect as all TCP participants would write to every top dog in the Forest Service. Also Jim Baichtal, the Forest Service Geologist was due to give a talk at the Karst Symposium later in the year saying how good the Forest Service were doing protecting the karst areas. Steve Lewis had managed to get a slot as well, speaking after Jim, and was going to discredit the Forest Service unless a drastic 'U' turn was made. This was not a plan that had been revealed to them. It was to be a surprise attack! The dye tests that were carried out on Heceta this year were all positive tests and all caves resurge at the same point. This is amazing as some of the caves are on the opposite end of the island; we are coming to the conclusion that the Island is just one massive cave system. The potential of this island is still yet to be revealed to us fully and we only work on small sections every year. For any diggers it is a place to visit although at the moment access is restricted, and as you can see from the surveys we are not allowed to print any locations. The forest service also have some weird guidelines in the TLMP: you can not name a cave after anything that will reveal its location, or after a living person. Although we have broken this one on a few occasions, for example, ?Simon Says Ouch!? named by Jim Baitchtal after Simon was hit by a boulder last year and made some weird squealing noise. Also the best of all, no domestic cats are allowed in the caves! After we all write our letters to the Forest Service it turns out that we seem to have had some effect, and they are reviewing the 21 units that are slated to be logged. After the 1997 Tongass Cave Project (TCP), we were told by one of our team members Eron Gissberg of a cave system which lay on Chichagof Island. Chichagof Island is situated on the South East Coast of the Alaskan pan handle. We were told of a cave that was around 3500 feet deep, had a very large amount of water flow passing through the cave system, the cave was also of blue marble. He also said that the cave had been dye tested from the top entrance and had a positive result at the resurgence which is around 50 feet above sea level. Around nine of us promptly decided to break away from the TCP and set up an expedition to this cave. The cave had already been named as Solstice Cave by parties unknown and we were also told that not much of the cave had been pushed. The expedition did not receive its name until one week before if was due to start. Its was named by Rob Knots and myself. The reason? Well, a lot of people did not wish us to go anywhere near the cave, even though we had invited these people to join our expedition. The reason why they did not wish us to cave did not reveal its self until a later date. 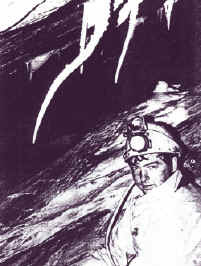 The expedition started with several days of abortive attempts to find known caves and no caving was actually done until 10 days into the expedition after meeting grizzly bears, obstructive locals and a pair of ?40 year old tree huggin proto yuppies in tie dye jeans?, to quote the report. Solstice Cave was finally found and explored over a few days. One of the theories why this cave has formed beyond the size of any other cave in Alaska is that the main entrance sat well above the glacial fields in what is known as a noonatak. Therefore it was not quarried away by the usual glacial erosion as one tends to find in lower elevated areas. In the lower lying alpine most of the caves have been scoured away or filled in with glacial erratics. The main reason for the large tree growth in the karst areas of Alaska is that the colander-like karst allows better drainage, and better drained soils tend to support better growth trees. Aerial photos show a sharp change in vegetation along what turn out to be contacts between carbonate and non-carbonate terrain. This is why the logging companies tend to log on karst lands which causes soil run off into the cave, as well as all the slash that gets washed in, causing the cave environment irreparable damage. That is the main reason for keeping secret the location of Solstice Cave. Most of the text has been taken verbatim from Simon?s reports. The photograph and survey were both by Simon and were taken from the 1997 report.